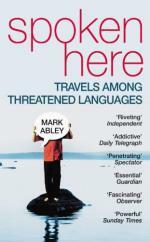 Mark Abley takes the reader on a world-wide trip like no other - from Singapore to Japan, Oxford to Los Angeles, through the web and even back in time. As much a travel book as a linguistic study, this book goes beyond grammar and vocabulary; more importantly, this book is about the people of the world. On his travels Abley encounters bloggers, translators, novelists, therapists, dictionary makers, hip-hop performers and web-savvy teenagers. He talks to a married couple who were passionately corresponding online before they met in 'meatspace.' And he listens to teenagers, puzzling out the words they coin in chat rooms and virtual worlds. Lively, evocative, passionate and hilarious, this is a book for everyone who cherishes the words we use. Mark Abley, a winner of Canada's National Newspaper Award, has written for the TLS, the Toronto Globe and Mail and the Montreal Gazette, and other publications. He is the author of one other book on language - the unanimously acclaimed Spoken Here. He speaks English, French, and a little Welsh.